Police said they were investigating the circumstances of Mrs Muliaga's death. The power company, Mercury Energy, said it had been unaware any disconnection would put her life at risk. Relatives of Mrs Muliaga, a schoolteacher, said she had been off work since February with a heart and lung condition. Because of this, the family claim, she had fallen behind with her energy bills. 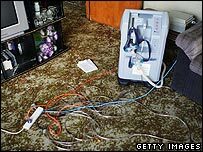 When a company representative arrived at the house to disconnect the supply, they said they impressed upon him her dependency on the machine to stay alive. Mrs Muliaga's son Letitaia, 20, said the employee showed no compassion. "He said he is here doing his job and he's here to cut the power off," he was quoted by local media as saying. Another relative, Brendan Sheehan, said that almost immediately Mrs Muliaga started to suffer breathing difficulties and collapsed. Paramedics were called but she died within two hours of the power being cut, he added. Mercury Energy said it was "deeply sympathetic" about the death, but disputed that its contractor had been made aware of Mrs Muliaga's condition. "We were simply unaware that loss of electricity to the household was putting a vulnerable customer at risk," general manager James Moulder said. Police Inspector Bruce Bird said the authorities were investigating the incident, but he added that it was too early to speculate on possible criminal charges. State Owned Enterprises Minister Trevor Mallard also warned against pre-judging the outcome. "I do think it is important that the facts are established before people rush to judgement," he said.